One or more downspouts drain too close to the home's foundation. This can result in excessive moisture in the soil at the foundation, which can lead to foundation/structural movement. Recommend adjusting downspout extensions to drain at least 10 feet from the foundation. The west side may need a qualified contractor to redesign and direct water away from the home. Gutters were observed to be leaking in one or more areas. This can result in excessive moisture in the soil at the foundation, which can lead to foundation/structural movement. Recommend a qualified contractor evaluate and repair gutters to proper functionality. The gutter on the rear of the house is loose and needs to be re-fastened to fascia and pitched properly. Flashings were missing above the garage at time of inspection. Flashings provide protection against moisture intrusion. Recommend a qualified roofing contractor evaluate and remedy to match the east side (3rd image). The batroom vent was deteriorated and rusting with areas of caulking that were failing, allowing possible water intrusion damage. Recommend a qualified professional evaluate and repair to prevent water intrusion. Decorative rock siding was damaged and showed signs of possible water intrusion. This could lead to further siding deterioration and/or mold. Recommend a qualified siding contractor evaluate and repair. I observed a damaged vent on the north side of the home that is believed to be the basement bathroom vent. The dryer vent location was not identified but is believed to be under the deck that had visibilty restrictions. One or more pieces of door hardware were damaged. Recommend repair or replace. The sliding glass door had a sliding screen door that was missing the screen. The screen should be repaired or replaced as necessary by a qualified contractor. Replacement is more typical. Two egress windows had inadequate window covers that would allow rain and snow to enter the window well. Recommend a qualified professional install proper egress window covers to prevent water and snow intrusion. A basement window on the north side of the house would benefit from a window cover to prevent prevailing wind driven rain and show from entering the window well. Recommend a qualified contractor install a basement window cover. I observed what was in my opinion inadequate grading of the property that may adversely affect the structure due to moisture intrusion. Recommend extending downspouts and removing snow from around the home in the winter to reduce chances of water intrusion. Gas Shut-off valve was just left of the furnace. The furnace serial number #0109185290 indicates that the furnace was manufactured in 2001. The black marker on the furnace indicates that it was installed in March of 2002. The serial number on the A/C unit (9601169217) indicated that the unit was manufactured in 1996 with an estimated SEER (Seasonal Energy Efficiency Rating) of 10. The A/C unit was not tested due to low outdoor temperature below 60 degrees. This may cause damage the unit. The A/C evaporator pan showed indications of current or past leaking. This could be a rusted pan, loose fitting or pluged drain line. Recommend a qualified HVAC professional evaluate. Water shut off is located behind the water softener. I was unable to determine where the Main gas shut off valve was located. I believe the main gas supply was the 3/4 inch yellow line coming in from the north above the water heater. Recommend asking the homeowner for future reference. The plumbing below a sink had flexible pipe installed. Flexible pipe ages, dries, cracks and is prone to leaking especially if disturbed by homeowner belongings stored under the sink. Recommend full hard PVC plumbing be installed by a qualified professional. The shower head installed in the whirlpool tub was leaking. Recommend repair to prevent water damage to an inaccessible space around the tub. I observed a loose faucet handle in the basement bathroom. This should be corrected to prevent further damage to the fixture. The water heater was in a confined space with insufficient combustion air. The water heater needs proper combustion air to reduce the risk of combustion gas spillage into the home. Furthermore, a furnace return air duct is located in the same confined space possibly causing negative air pressure in the confined space while the furnace fan is running. Recommend draft testing by HVAC company while the dryer and furnace are running. Recommend leaving the furnace room door open in the mean time. The serial number (F93464563) indicated that the water heater was manufactured in 1993. Water heater showed normal signs of wear and tear and was still functioning properly at the time of the inspection. Recommend monitoring it's effectiveness and replacing in the near future. Water stains were observed beneath water heater, indicating a past or present leak coming from the TPR valve. Recommend further evaluation and repair by a qualified plumber. The Pump and other components of the whirlpool jet tub were inaccessible for inspection for leakage. Recommend installing an access panel to alow for easy inspection and repair of components. At the time of inspection the exterior panel was missing labeling. The interior panel had an unidentified and disconnected wire inside the panel. Recommend a qualified electrician identify and map out circuits and identify all wiring. I observed missing Grounding/Bonding at the location. In my opinion the Grounding/Bonding should be evaluated by a qualified professional. 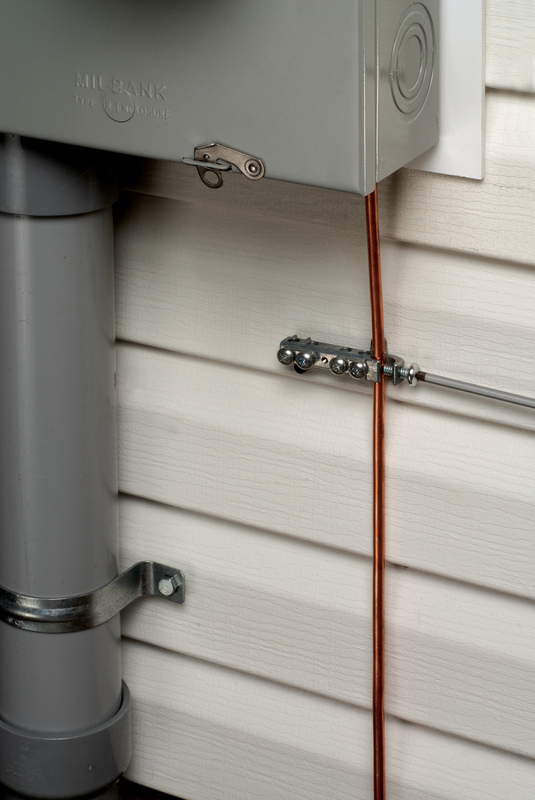 All metal components of a home shuld be grounded and bonded to the electrical system, including metal siding. Observed exposed wires in the end of conduit on the west exterior of the home that used to feed a hot tub. Due to the lack of proper labeling of the electic panel it is not known if the wires are hot. Recommend a qualified electrical contractor evaluate and label the wireing/breakers. The metal siding was not grounded/bonded to the electrical system. All metal components of a home should be grounded/bonded to the electrical system. Here is a picture of one example of how to do this. Recommend a qualified electrician evaluate/repair. One or more junction boxes were missing a cover. The exposed wiring/wire connections can lead to a shock hazard. Recommend installing junction box covers. I observed an area that in my opinion should have a smoke detector. Here are two helpful articles about smoke detectors. I observed that there was not a carbon monoxide detector at the location. One per floor and one in an attached garage is recommended. Insulation depth was inadequate in many areas. Recommend a qualified attic insulation contractor install additional insulation up to our zone recomendation of R49. The attic hatch has missing insulation and does not have a gasket to seal the hatch. This can cause unnecessary heating and cooling costs and possibly condensation in the attic. Observed a cracked rafter in the attic. Recommend a qualified carpenter to evaluate/repair to maintain the roofs ability to hold up to snow loads and foot traffic. One or more window sills showed elivated moisture readings indicating moisture intrusion from an unknown source. Moisture levels above 20% in building materials promote mold growth and material decay. Recommend a qualified professional evaluate/repair/make recomendations to reduce moisture intrusion. A window in the basement bathroom would not open due to a wet and swollen window sill as indicated by the moistuer meter. Recommend evaluation/repair by a qualified professional. Serial number F71001337 indicated that the dishwasher was manufactured in 2017. Serial number K43416704 indicated that the range was manufactured in 2014. The installation and manufacture dates may vary. Dishwasher drain pipe was installed improperly. The drain pipe should have a high-loop or air gap to reduce the possibility of contaminated water backflow due to a clogged drain. Recommend a qualified plumber evaluate and repair. There is a stain on ceiling/wall that requires repair/paint. Source of staining could be old or active, the area was dry at the time of the inspection. Recommend painting with oil based primer and monitoring. Garage walls showed signs of moisture intrusion. Recommend a qualified contractor evaluate and find source of moisture and offer a solution to prevent further baseplate and sheetrock damage and/or mold growth. The auto reverse sensor was not responding at time of inspection. This is a safety hazard to children and pets. Recommend adjusting the pressure at witch the door will reverse upon hitting an object. This can take some fine tuning to ensure that the door shuts in all conditions and temperatures. Sometimes a balance between safety and functionality will have to be met. Homeowner belongings were an inspection restriction is some areas such as closets. The flooring and walls were not inspected for defects in the closets and under/behind furniture for example. Recommend doing a through walk through before the closing date to check for any hidden damage or water intrusion. The gas fireplace was not operated due to unidetified controls. Recommend asking the homeowner to identify fireplace controls and demonstrate operation. The sauna does not fall under a general home inspection and was not inspected or operated. Recommend asking the homeowner to identify sauna controls and demonstrate operation. The exterior foundation was covered by siding and flashing and the interior foudation is covered by a 100% finished basement. I was unable to see any part of the foundation but did not observe any indications of bowing, settleing, or water intrusion in the foundation.